Who's been using our hiatus to spread more lies about Fox? The Outfoxed gals, of course. With J$P Video! Just take some time off and the Fox haters run amuck! Apparently they take it as a green light to launch more lies and slanders at FNC. So we have to suspend our respite to deal with some of the drool from the newshounds (another fine product of the Outfoxed mob). Actually, it's kind of sad if that's the only way Bill [O'Reilly] can get people to visit his website. Billo doesn't have the capability of rational thought. Perhaps he had one of hit toadies figure it out for him. what a sicko Billo is. Cannot find his own audience any more? Sad pathetic man. The big stink in the GOP debate on Fox turned out to be the unscientific text message survey, which the mutts growl that FNC was "hiding" because Ron Paul came in second. They insisted that foxnews.com "thoroughly buried" the results, using the simple expedient of time. The results were a headline on the Politics page the night of the debate, as well as the next day. So the curs waited until two days after the debate, then complained they couldn't find the story! Of course by then it was old news and no longer one of the day's top headlines. 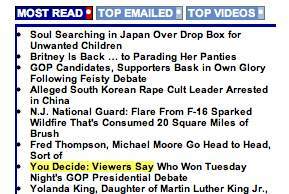 Note that the poll results article was one of the most read articles on the website. Pretty neat trick for an article that was "thoroughly buried"! This bill was crafted in a bi-partisan [sic] manner but Fox doesn’t really want you to know that.... That Bush supports this type of immigration reform must be difficult for Fox to spin, so any mention of Bush, in this context, is kept to a minimum. The newshounds. Serving up lies about Fox 24/7.